You are investigating a comprehensive in vitro exposure system for inhalation toxicology or skin testing – we have the expertise and technology to support you. Intense collaboration with diverse in vitro project-teams and their specific research needs has been our dedication for over 15 years. This has enabled us to continuously advance to a global market-leadership in cutting-edge modules and customized systems for innovative in vitro research requirements. Talk to us in confidence about your project and we will expertly match your needs with specifically configured module-systems to ensure your research success. Our experience in facilitating meaningful and significant in vitro research, allows us to provide you with a complete, efficient and tailored service from start to finish. Our mission is to assist the attainment of your research goal by working hand-in-hand with you. This integral commitment to your research means you can count on us to propose optimally tailored components, provide turnkey installations, international training and a world-class service exactly to your requirements. Advanced equipment solutions for in vitro characterization of airborne substances such as gases, complex mixtures, nanoparticles and fibers at the air/liquid interface. The configuration of the components takes into account the type of aerosol, cell culture insert sizes, mammalian cell system as well as dosimetry. 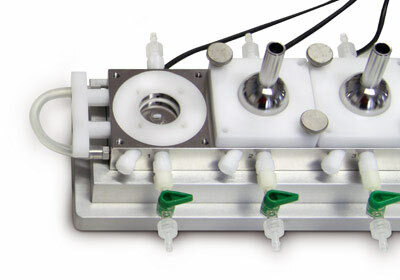 High tech equipment solutions for the exposure of skin tissue to solid, pasteous, liquid or gaseous substances. 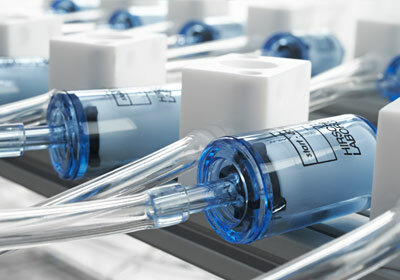 VITROCELL® Skin modules are a powerful alternative to glass-made Franz cells as they offer improved handling, higher throughput and options for automation. 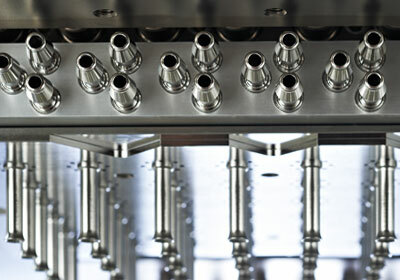 A range of durable components for a successful and durable operation of our exposure systems. Own equipment solutions were developed when commercial solutions are not available. 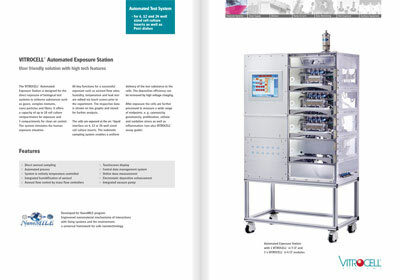 VITROCELL® approved auxiliary equipment fits perfectly to our turnkey installations. Valuable information for your in vitro research: product information, numerous scientific publications of our customers and relevant contact information. Highest quality products and our unique customer result-oriented service make each VITROCELL® solution a crucial investment for your future in vitro research. Our advanced product developments are based on a wealth of experience gained from decades of collaboration with experts driving the field of in vitro research around the world. From smaller starter kits to large, high-throughput installations - VITROCELL® will work with you for customized, cutting-edge solutions to your specific research needs.